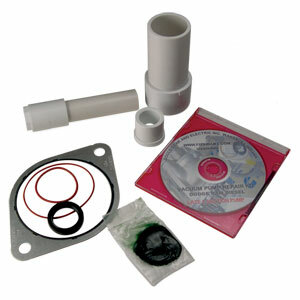 This vacuum pump reseal kit by Gould repairs the engine oil leak on the '96-'02 Dodge Cummins Turbo Diesel engine where the power steering pump joins the vacuum pump. This is a common leak since the seal inside the vacuum pump ages with time. Why buy an expensive new vacuum pump when you can rebuild it? Outstanding instructions. The tips alone are worth the extra dollars and saved me time and frustration. The small details make the difference! Nice to see the extra effort to satisfy your customers! The video and rebuilt kit worked great. Saved me buying a new one! I just rebuilt my pump with a Cummins rebuild kit. It leaked worse than before! After 2hrs and this kit I have no leaks! Instructions and product are amazing no reason to buy anything but this! Great instructions so even a novice can do it (If you can get the pump off the pickup). Used the repair package and tools. You couldn't ask for a better experience. This package has it all! outstanding parts and service !!!!!! Jun 21, 2017 | By Dan Tripp Sr.
5 stars! Mr.Gould's customer service is unheard of in this day and age, great product and super customer service! Thrilled with product, instructions were very easy to understand and tools included to help with removing old seals and installing new ones made job very easy. Kit is perfect. Comes with extra O rings in case you pinch one installing. Instructions and tools make it super simple. Took me 4 hours start to finish. Thank you Genos! Great kit, easy to follow directions and was happy to receive a set of hand warmers because it was negative 40 here in ND! My vacuum pump seal was leaking badly. I bought this kit because it came with the double lip seal plus seal drivers for an easy install. I installed this seal kit in my truck over 6 months ago and the pump is still leak free. Awesome kit, don't hesitate to buy it and get rid of that annoying oil leak. Just take your time breaking the pump down and putting it back together. Remember the pump body is cast aluminum so don't pry against it. This kit is an affordable way to reseal your oil leak at the vacuum pump, Easy installation with the supplied seal drivers! "So after searching all the local parts stores and truck parts stores in a 50 mi. radius, I finally called Geno's after seeing they have the filter I need for my Fass 95 online. Great customer service, great prices. My order came on time with a free bumper sticker and hand warmers lol. They even threw in a free adapter to run the new style filters. Thanks, Geno's! You saved the day, got my baby running right, and you have a new customer for my Ram parts."